Are you a college or university student currently enrolled in an Architecture, Interior Architecture, or Landscape Architecture program? 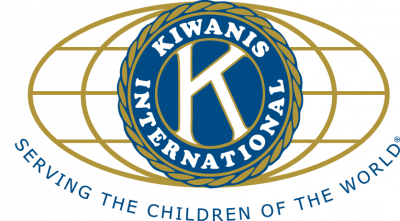 Have questions or want to receive more information? Email, walkonwater@fiu.edu. Please click here to view the 2018 WOW Flyer for external participants. 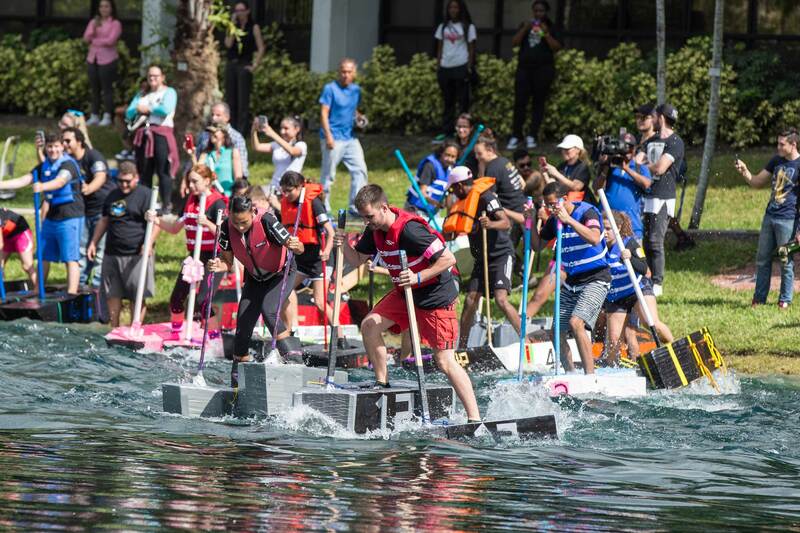 For 29 years, FIU Architecture students have participated-in and celebrated Walk on Water, a race founded and orchestrat­ed by Professor Jaime Canaves. Each student designs and constructs shoes that will allow him/her to walk the length of the Green Lake at the heart of FIU’s Modesto A. Maidique Campus. In Fall 2016, WOW opened the competition to students from across the country. Students from the University of Florida and Palm Beach State College competed with FIU students for scholarships and were granted travel awards from our main sponsor, CGI Windows & Doors. In addition to the standard race awards, Walk on Water was able to award graduate assis­tant scholarships, travel scholarships for study abroad programs, and 1st place awards. The event occurs every November with approximately 50 students participating in the race. 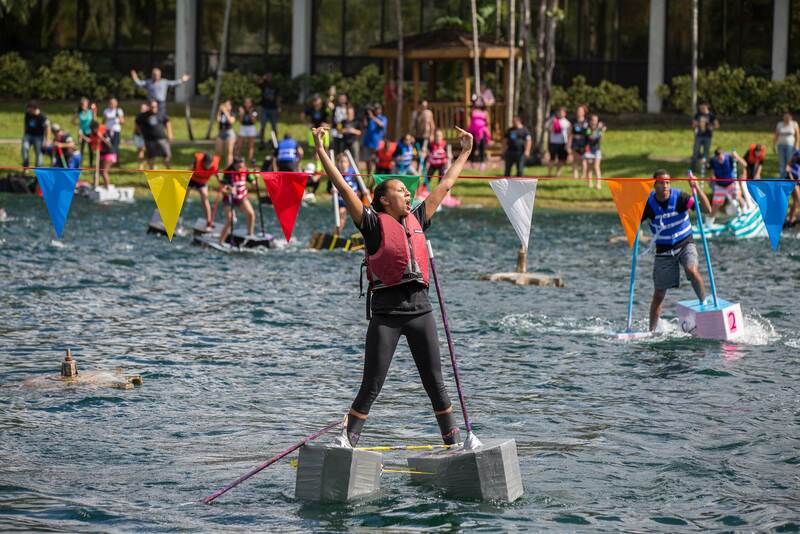 A favorite activity of the Fall Semester, Walk on Water is attended by students, faculty, staff, alumni, community members and media who watch with excitement as they cheer for the winners – and for the ones who fall in! Media and press outlets cover the event nationally and internationally. East side of Green Lake, FIU Modesto A. Maidique Campus, 11200 SW 8 ST, Miami FL 33199. To design and build a pair of floating footgear that enables the wearer to “walk on water”. Walk on Water is a competitive event in the style of a marathon race. Participants are positioned at the East side of the FIU Green Lake and “walk” across to the finish line at its West corner, a distance of 275 ft. Architecture, Interior Architecture, and Landscape Architecture students enrolled in Professor Jaime Canaves’ Materials & Methods of Construction course participate in the Walk on Water event as a class assignment. Students from other universities are also invited to participate in one race. FIU class students will participate in the FIU only race, and only a select number of them will be eligible to participate in the other race. $1,000 will go to the team or participant who crosses the finish line with the fastest time without falling into the water. Foot gear are to be designed, constructed & piloted by the participant or teammate. Forward motion needs to be as similar to the act of walking as possible. No other power source is acceptable. Mechanical devices or attachments will be acceptable to assist in traction, but not to generate power. Attachments for balance can be provided as long as they are part of the foot gear. 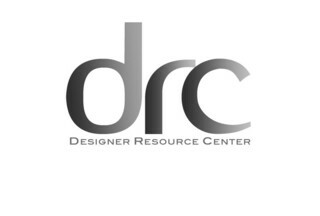 Functionality, creativity, aesthetics, craftsmanship and economics will be considered in the criteria. Shoes must be attached to feet. No sails or helium balloons. Shoes cannot have metal, sharp edges, or any material that creates a safety hazard. All Styrofoam or similar materials must be covered or protected against breakage. – Gift-in-Kind donations reward students and bring together alumni, community members, and the university at large in supporting talented students.  – Media sponsors help engage the local and national community to show what is happening at FIU as well as inspiring creative thinking and design.